Get into Minnesota’s most rugged and scenic wild places. From Duluth to Grand Portage, discover magnificent trails that wind through nine state parks, the Superior National Forest, the Superior Hiking Trail and even into the BWCAW! 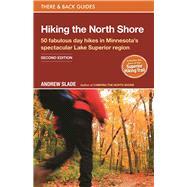 Naturalist and North Shore expert Andrew Slade has scouted out over 300 miles of trails along inland ridges and Lake Superior shoreline for this indispensable guide. Grab your boots and go! Those new to Minnesota’s North Shore, as well as experienced hikers in Lake Superior country, will find Hiking the North Shore the most comprehensive resource around. Andrew hiked every trail, checked out every overlook and visited every waterfall, so you can plan a perfect day’s hike. Find recommendations for short and easy hikes that will quickly plunge you into a true North Shore experience, as well as longer, more challenging hikes that will take you to the highest points in Minnesota, unusual geological formations and old-growth forests. Hiking the North Shore encourages and inspires hikers of all skill levels to get out and explore these beautiful routes. What are you waiting for? Gear up for the best hiking in the Midwest! Andrew Slade’s parents first set eyes on each other on Minnesota’s North Shore of Lake Superior, and Andrew’s life has centered there since birthdespite growing up in the Twin Cities. As a kid, he caught nets full of smelt at the Cross River, jumped cliffs into the deep pools of an unnamed North Shore river, helped to band woodcock in the open fields of North Shore homesteads, and shut his eyes tight each time the family wagon drove around Silver Cliff (today there’s a tunnel through the cliff and his eyes stay wide open). With his intrepid father, he had to abandon a mid-1970s assault on Carlton Peak due to a lack of recognizable trails. As a canoe guide and outdoor educator in Ely, he learned that sauna” is a three-syllable word (sow-ooh-nah). In his twenties, he bushwhacked by snowshoe much of what is now the Manitou-Caribou section of the Superior Hiking Trail. At age 28, in his before kids” era, he was the editor and lead author of the first Guide to the Superior Hiking Trail. Slade graduated from the University of Minnesota with a BA in environmental education and from the University of Montana with a MS in environmental studies. His favorite wildflower is Mertensia paniculata, the native North Shore bluebell. Andrew has worked for environmental education and preservation organizations on the North Shore since 1992. You can reach him at andrew@thereandbackbooks.com and read his North Shore blog at bestnorthshore.com.